Cary Coole is a native Houstonian. He attended the University of Texas and received a Bachelor of Science degree from the University of Houston, where he studied finance and economics, history, political science, and psychology. After attending law school, he went into banking. In 1975, he formed The Coole Company, Inc., which has recently celebrated it�s 26th year in the real estate business. In 1980, he published his first book, Appraise Your Own House (And Other Crystal Ball Gazing), a tongue-in-cheek but accurate view of the real estate markets at the time, in which he predicted the severe breakdown that would occur later in that decade. 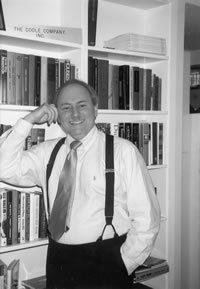 After being involved primarily in real estate investment, analysis, appraisal, and consulting for many years, he was particularly gratified to be involved with a group of thirty real estate professionals from around the nation who were invited to Russia and Lithuania in 1993 to consult with government officials regarding the privatization process of each country. Mr. Coole is married and has a son living in Atlanta and a daughter in Houston. After years of dealing with the ups and downs of the real estate market, he is returning to his first love: history, writing, and being a self-styled social critic. The Bridge to the 21st Century is the first of a trilogy of books dealing with life in America�past, present, and future.